I did not know so I looked it up in Johnson's Gardeners' Dictionary, edited by J. Fraser, F.L.S., F.R.H.S. and A. Hemsley (London: George Routledge & Sons, Limited, 1917). This is a new edition "based on the Original Edition of 1846, thoroughly recast and brought down to the year 1917". "GILLIFLOWER. 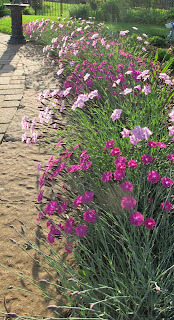 By some supposed to be a corruption of July flower, because the carnation (Dianthus caryophyllus) flowers in July. Other spellings are Garryophyllis, Gelovers, Gelouers, Gelyflours, Gilleflouce, Gilloflouce and Gilloflower. The French form of the word is Giroflée. These names are evidently all corruptoins of Caryophyllus, the specific name of the Carnation, and that is derived from the Greek karoun, a nut, and phullon, a leaf, applied by the old Dutch to Caryophyllus aromaticus, not Eugenia caryophyllata, the clove of commerce. The name became applied to the Carnation on account of its clove scent, and by the French also to the Stock and Wallflower. In this country Gilliflower means the carnation only." From all this, it appears that the common name gilliflower can refer to carnations (Dianthus), stocks (Matthiola), or wallflowers (Erysimum). I feel fortunate to have some gilliflowers, Dianthus, in my garden and I have seeds for gilliflowers, Matthiola, to sow this spring. I consider both to be easy to grow flowers. Oh, and one more thing about gilliflowers... There is a sweet little garden fairy out in my garden named Gilliflower Silverleaf. She's responsible for adding scent to the Dianthus, I mean gilliflowers, that grow along the edges of the patio. I love the scent of Dianthus, Wallflower and especially stock....it's just fabulous!! I am of Greek descent, and I learned at a young age that the Greek word for carnation is garifalo. I've often wondered what a gilliflower was~I first made their acquaintance in a Phyllis Whitney book when I was a teen. So is it pronounced like the girl's name Jill or like the gill of a fish? Kathy, it is pronounced like the girl's name "Jill", I pretty sure. Love Dianthus barbatus, have 2 dozen seedlings making up their minds to bloom, hopefully white but I'll take what I get from saved seed. Love 'Bath's Pinks' too.